If you love Pokémon, you’ll also love Pocket Trend’s Micromon—because it’s practically the same game. 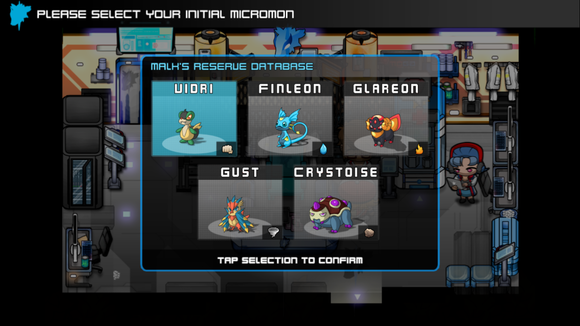 Micromon is an adventure game in which you use “Micromons,” or “micro monsters” (instead of “Pokémon,” or “pocket monsters”) to battle other characters and players. You—a newly minted Micromon tamer—travel throughout the world of Pixekai catching Micromons, training them, and battling gym leaders—er, Legion members—to collect certificates that prove your skill. This is a Legion member, not a gym leader. TOTALLY DIFFERENT. Catch more Micromons throughout the game. 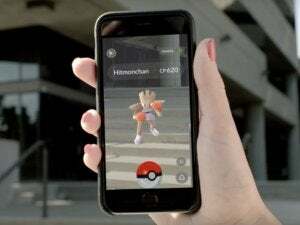 The game starts when you’re mysteriously transported into a digital world via an app. An orb-shaped robot comes along and picks you up, asks your name, and gives you an avatar through which you can explore this world. You then meet a professor/researcher type who randomly asks you to help him collect data on Micromons throughout the land of Pixekai. 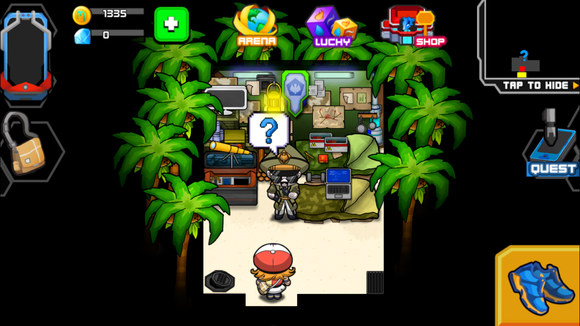 While the beginning is somewhat similar to a Pokémon adventure, the game quickly changes into a series of weird quests, such as finding a town’s kidnapped mayor (who actually hired the pirates to kidnap him because he wanted a break), and learning a heck of a lot about random characters’ love lives. Micromon is also quest-driven, rather than simply pure open adventure, like Pokémon, so you never feel like you’re just aimlessly wandering through Pixekai (because you’re not). 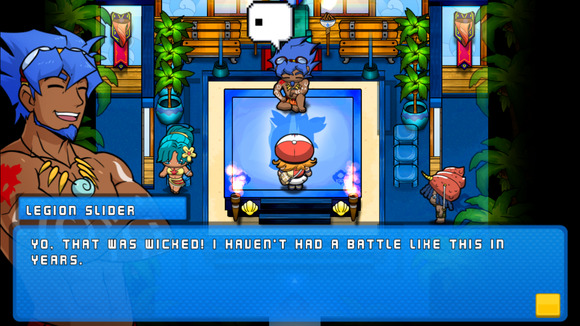 Instead of being a pure open-adventure game like Pokemon, Micromon is quest-driven. 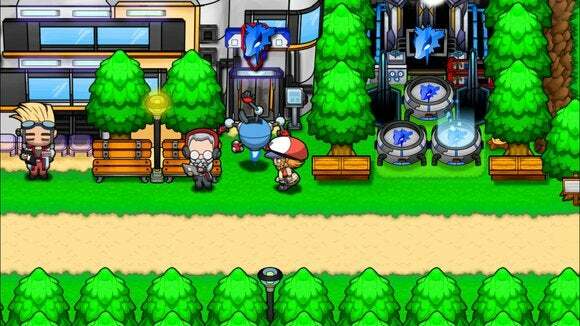 Micromon is appealing in the same way that every new Pokémon game is appealing—it’s a familiar story format, but it’s a fantastic familiar story format, and it’s different enough that you don’t feel like you’re wasting your money. There’s an online multiplayer component: What fun is collecting miniature digital monsters and training them up to be level 60 bad-asses if you can’t kill other people’s digital monsters? Unfortunately, with Pokémon (and, to a lesser extent, fighting Tamagotchi-style games like Digimon), you have to be physically near your real-life opponents to battle them. Launch the multiplayer arena to get matched up with an opponent and battle them in real time. But not with Micromon. In Micromon, you can simply open up the online multiplayer arena and get matched up with an opponent in a matter of seconds. The multiplayer feature of the game isn’t perfect, and the matching seems a little spotty—I found myself matched with players that were everything from perfectly my equal to a much, much higher level, but it was fun nonetheless. If you have an older device, the app may crash, but it worked perfectly fine on my iPhone 6. It’s just really well done: It’s almost shocking how similar Micromon is to Pokémon, but what’s even more shocking is how nicely it’s executed. 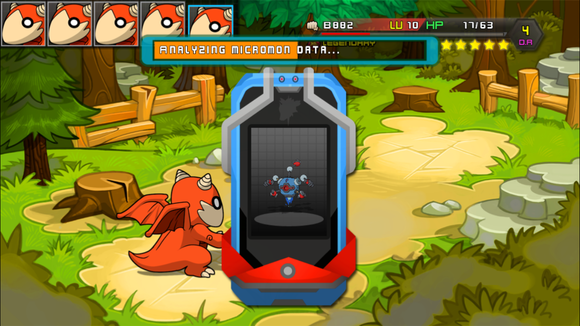 Micromon’s artwork is superb, with crisp, high-definition graphics and almost overwhelmingly bright colors. The soundtrack is invigorating, and animations are smooth and on-point (if a little over-used). Everything about this game looks polished and professional, and if I’d never heard of Pokémon I’d certainly think this was the beginning of an epic franchise. Plus, for the game’s entry price of $1, you get hours of gameplay. The world of Pixekai is huge—almost as huge as any Pokémon world, and Pokémon games usually go for $60. Sure, the developers are a little stingy with the game’s second currency (diamonds), but you don’t need to shell out any extra cash to complete the game (it’ll just take you a little longer).